What's the smallest number you've seen on your Miles Remaining? Single digits? Were you in the middle of a National Forest above 10,000 feet in 25 degree snow? Then I may have you beat. We talk about range anxiety and the road trip that had me thinking I'd be riding in a tow truck. Tesla has quietly made a 100D model available, saving you $42,000 over the P100D. If you'd like the 300+ mile range but don't care about Ludicrous mode or sick 0-60 speeds then this is good news for you. Elon Musk says that by the end of the year Tesla will demonstrate a cross-country completely self-driving road trip. Like, get in the car, program the destination and ride along self-driving! That explains why some HW2 equipped cars are being "held back" with some features. They are being fine-tuned to allow totally hands-off road tripping! Musk has been appointed to TWO advisory groups for President Trump. He joins Michael Dell and others on a new Manufacturing Council in addition to the Strategic and Policy forum announced earlier. This has caused some controversy as Musk had previously said Trump, a climate change denier, wasn't right for the position. Twitter, of course, reacted. It's the best spare tire you can get. It's perfect for those times there is no place to eat near the Supercharger. It's the Downtube 8H folding bike. This is a premium bike, with Shimano 8 speed internal geared hub, Gates belt drive and a solid build. At $699 you get great features and a bike that fits perfectly into the rear footwell of the Model S.
And the blue is a perfect match for Tesla blue! What is it about keeping people put in Model S? Last year it was a seat belt issue, now it looks like an airbag recall. Find out if your car is one of the ones that could have an issue. Even MORE work and workers planned for Nevada's Gigafactory, as Elon Musk announces that Tesla will be building motors and gearboxes for the Model 3 in the factory. No cell service could leave you with a Tesla that won't go! IF you've used the app to start and the key isn't with you... you're gonna have a bad time. This week we talk about updates. And why you shouldn't be in the club when you've scheduled a 12:20 a.m. update. They aren't lying when they say you won't be able to use your car while it's updating! Clearly Elon wasn't happy with the FF91 outdoing Ludicrous mode! Tesla has a new vice president heading up Autopilot efforts — Chris Lattner, who worked at Apple for 11 years, where his chief contribution was creating Swift, Apple’s most recent programming language. Elon Musk said that he’s aiming to have a fully autonomous coast-to-coast test drive of a Tesla car ready for the end of this year. Lattner could be a big help in achieving those ambitious goals. Tesla has announced pricing for Supercharging on vehicles ordered after January 15th. New Tesla's will get 400 kWh per year free, then will have to pay the additional fee. Looks like the fees are still much cheaper than gas. And, of course, only applies to Superchargers. Follow the link and see what it will cost in your state. 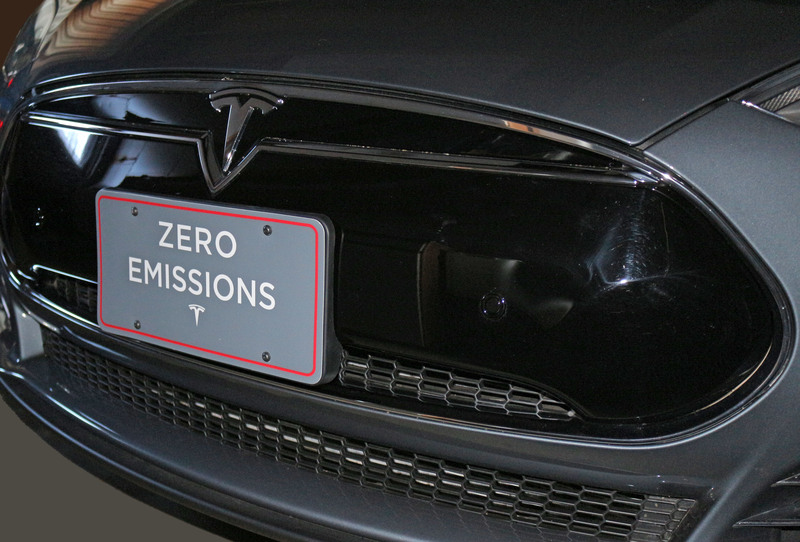 If you live in a state that requires a front license plate but can't bear the thought of drilling holes in your Tesla's nose, here is a cheap and efficient way of having on only when you need one. And, best of all, it's a $20 solution! Episode 3 - A Future For Faraday? The 50th anniversary CES kicked off in Vegas this week and one of the first big stories was a HUGE event from Faraday Future. In case you don't know who they are, they announced a "Tesla Killer" EV a year ago. They have been plagued with financial issues and written off by some as vaporware. But they came back with a vengeance when they announced the FF91. Yikes! We run down all the features and specs on this week's episode. So, what's up with that logo? The company's initials... falling flat on their face. EEK. Elon says the Roadster is coming back! But... "some years away." "Hardware 2" equipped cars should have Autopilot features fully functional by this weekend. Battery production has begun at the Gigafactory in Nevada. Hopefully they'll start cranking out Model 3 batteries by Q2 of this year. Wash your car in the garage WITH NO RUNNING WATER! This is awesome. I love washing my Tesla by hand and this makes the process painless and I can do it no matter how cold it is outside.